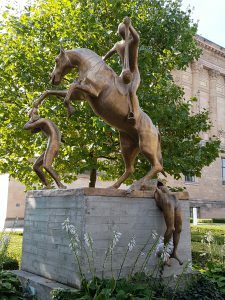 A mysterious and fascinating sculpture in the garden of the Alte Nationalgalerie, inaugurated on 14 September 1915, on exhibit for two years only. In this sculpture the group of artists working under the name ‘Atelier van Lieshout’, has expressed their concern about the changes in our society, as they explain themselves. Exhausting supplies will lead to harshening of relations between people and increased survival instinct. Radical changes, coupled with violence, will lead to a new society, either good or bad. The artists have chosen a horse and rider with two figures, as a metaphore of this situation. We see two human figures which clearly are victims of violence represented by the horseman. The rider balances with a ball in a net, which image may indicate he is balancing interests, either in a good or in a bad direction. This sculpture is an example of the use of the horse to express strong emotions, as The Apocalyps does and Pablo Picasso did in his work. Moreover it shows the horse still is an important theme in art, also in present-day art.